Kushalnagar: The four crest gates of Harangi Dam in Somwarpet taluk of Kodagu were opened yesterday releasing water to KRS Dam. The gates were opened at 4 pm yesterday and 1,200 cusecs of water was released as the first instalment. Henceforth, the gates will be open as and when the storage capacity increases. Following water release from Harangi, the water level at KRS will see an increase. The Dam’s today’s level stands at 108.77 feet with an inflow of 3,066 cusecs and an outflow of 3,482 cusecs. The maximum level is 124.80 cusecs. The Harangi Dam is an important reservoir along the Cauvery Basin and rainwater has to collect in this dam first for it to flow into the KRS, irrigating lakhs of hectares of paddy and sugarcane fields. Last year, the Dam touched its maximum level on July 23 and this year, the maximum level was reached on July 7, 16 days early. Thanks to copious rains in Kodagu, the Dam recorded 2,856 ft water at 5 pm yesterday. The maximum level of the Harangi Dam is 2,859 ft and there was an inflow of 24,450 cusecs. The water from Harangi Dam reaches the KRS Dam through Harangi River near Koodige. The Harangi Dam can hold 8.5 tmcft (thousand million cubic feet) of water and the present storage level is 7.25 tmcft. Moments before the gates were opened, warning siren was sounded three times for the people in the river and on the edges to move to safety. Hearing the sirens, hundreds of villagers and tourists rushed near the crest gates to witness the water release and enjoy the drizzling waves of water as it gushed out from the Dam. 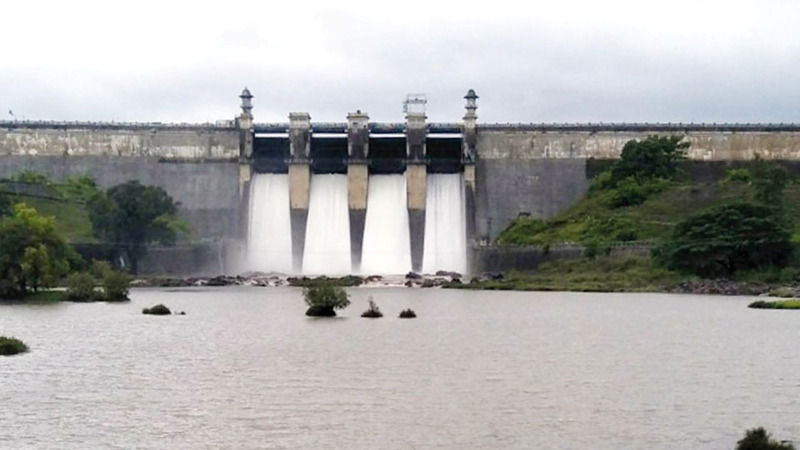 Harangi Dam irrigates over 1.5 lakh hectares of land in Periyapatna, Hunsur, K.R. Nagar and Arakalagud in Hassan.